I hate to be cynical, but how long does the honeymoon last, anyway? Is everyone supposed to be blushing, and giggling, and cooing, and making kissy-face uncontrollably in public just because it's Valentine's Day? C'mon, most of us are actually suffering from some major heartbreak on Valentine's Day, just like most other days. And face it, anyone can send a mushy card and a rose or a heart box with a bow on it.... But there are those of us who are dying to stab the objects of our love in the heart, metaphorically speaking. 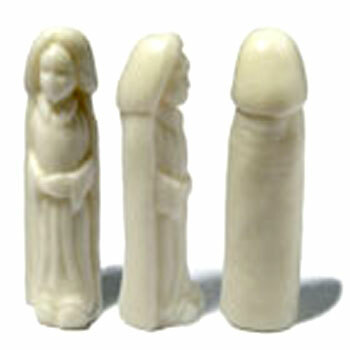 So, I took it upon myself again this year, to find some Anti-Valentine gifts that really show how deeply you love. Why pull any punches? She may not put it on a charm bracelet, but the shock effect of just seeing this charm and knowing how you really feel will be more than worth the $8 you spend for it. A Pugster product made of stainless steel, available at Amazon.com. 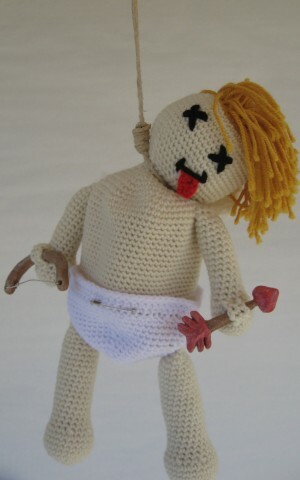 When you care enough to send the very best, this little cupid's all very nicely handmade. The Heart Man's been roped by the Hang Man, for good. And you are grateful! The Hang Man Purse is all handmade, and Cupid's 8" body hides a 6.5" opening (under the diaper) and his poor heart is a 4" change purse. Bow and arrow are waterproof. At Etsy. He can confess and clean his hands at the same time. Holy Moly Hand Soap is available from Donkey Products. This steak knife set is designed by Carlo Contin and made in Itally. 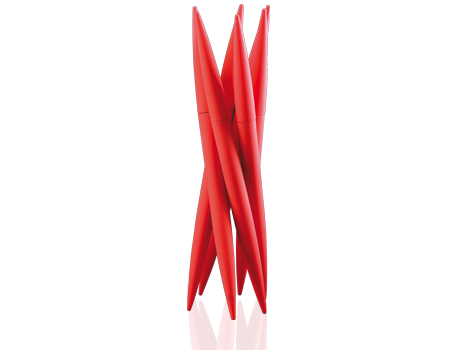 On the surface, because they're red, the knives seem to be an elegant Valentine's Day gift. But who gives a set of 6 knives for Valentine's Day? Now don't give this kit away. You need the stamps to keep sending your loved one hate mail. 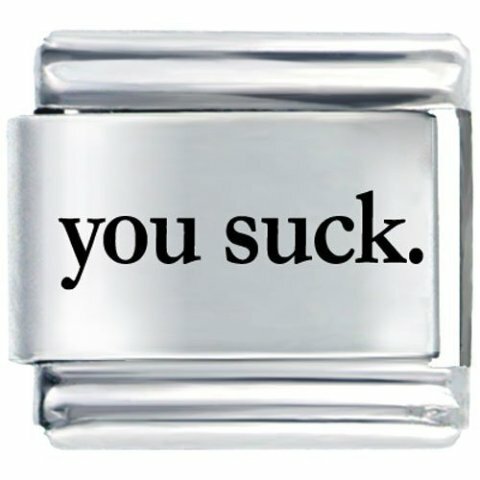 Periodic letters with nothing but a stamped impression inside that says "screw you," or "shut up" or "Jerk!"... will warm the cockles of their black hearts. 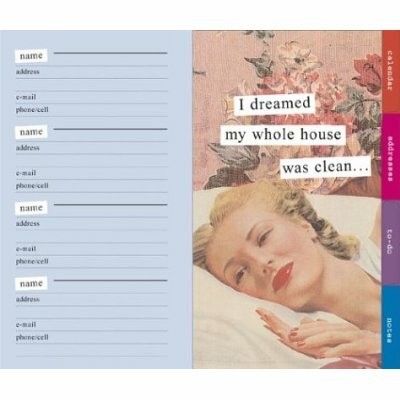 The I Hate You Stamp Kit is at Chronicle Books. It's So Involved Being Me Organizer at Amazon.com. Oh, you miss me do you? Well, here's my lap. Have fun! 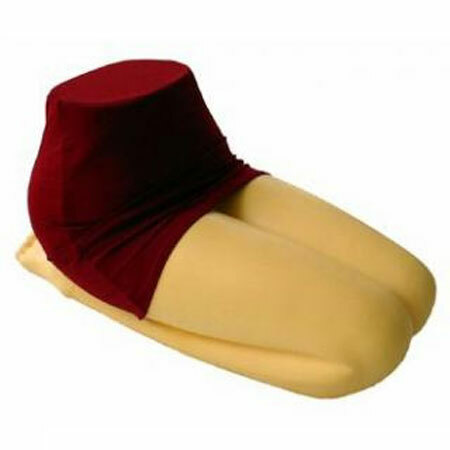 Described as "skin-coloured polyurethane calves folded under soft thighs, a comfy cushion for napping, reading, or watching television," which is all he is going to get from you! HimeyaShop.com. Don't they look sweet? 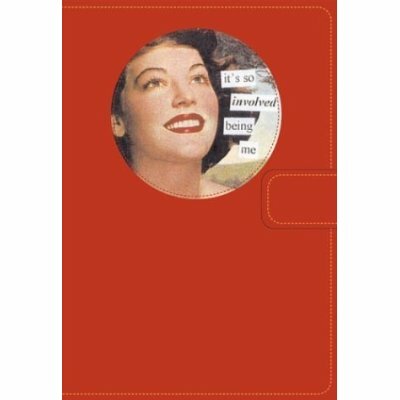 They are so pretty and colorful... colored glass, vintage-style paper backing, and a strong rare-earth magnet to place it where your lover can't forget. Wait! These say, "I guess," "whatever," "huh? ", "no way," and "Eh?" "Eh?" Not exactly what they want to hear. 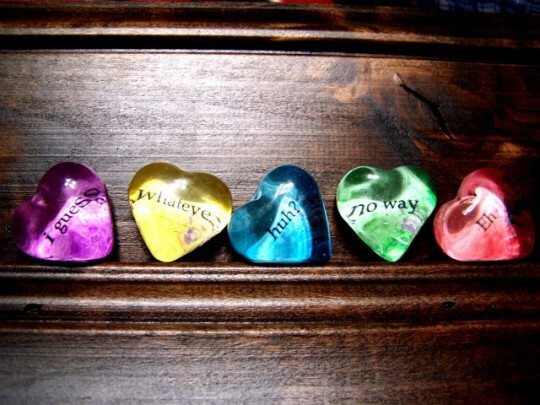 The Heart Magnets come five in a set, but feel free to split them up so you can give one to each of your Anti-Valentines. Etsy. Who doesn't want a chocolate heart for Valentine's Day? But this one is not a heart-shaped box or even a heart-shaped chocolate... it is an anatomically correct human heart! "There now! You wanted it? Are you satisfied?" 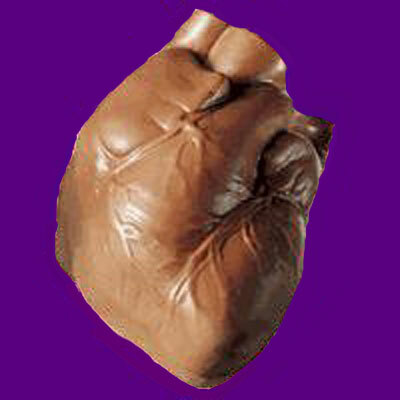 One-pound solid milk chocolate heart at Amazon.com.